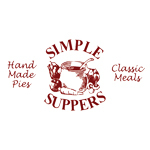 Simple Suppers founded by the Graham family over fifteen years ago are a stalwart in Gloucestershire’s food industry. They have developed a loyal following over time quite simply because the pies they bake are mouth wateringly delicious. The sausage rolls and classic pies such as chicken, Somerset, and beef and Guinness use a rough flaky pastry that’s difficult to beat. Gill Graham developed the pastry recipe herself as she wanted a pie that you could bite into without it collapsing!